Did you know that you can make your own cat litter, either for nothing or for a fraction of the cost of buying it in the shops? Making your own kitty litter can be both greener and cheaper so why not give it a go? Traditional cat litter often uses ingredients which are not biodegradable and when it’s been used it therefore has to be sent to landfill. What’s more, some clay litters actually absorb water which causes the clay to expand, thus taking up even more landfill space. Some cat-lovers are also worried about the health of their cats when using commercial cat litters. Although there isn’t thought to be conclusive evidence, there have been some concerns about the effect that certain dusts from shop-bought cat litter can have on both cats and humans. 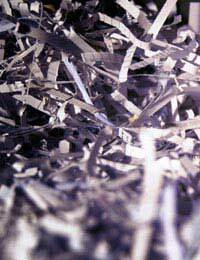 Step one: Shred the old newspaper up using a shredding machine. Step two: Fill a bowl with warm water and add a few drops of liquid soap or washing-up liquid. Step three: Whilst the newspaper is soaking, fill another bowl with clean water – don’t add soap this time. Step four: After around five minutes, use the colander to drain the newspaper from the soapy water. Step five: Now soak the paper for another five minutes in the clean water you’ve prepared. Step six: Drain the newspaper again. Step seven: Sprinkle baking soda onto the paper mixture. Step eight: Wearing gloves, squeeze and knead the paper mixture to remove as much water as you can. Step nine: Lay the paper on a dry surface and leave it to dry out completely. Step ten: Once it’s completely dry, you’ll be able to crumble it to make cat litter. You can then use it as you would ordinary cat litter. Scent such as fragrant dry herbs and lemon and orange peel. Mix all these ingredients together well to make a cat litter that is very low odour. Store the litter in an airtight container until you need to use it. It’s true that some cats are very fussy about their cat litter and if they’re used to commercial cat litter, they may snub the homemade one at first. Of course, you shouldn’t force your cat to use the litter if it distresses them but a little perseverance can pay off. Try mixing the homemade litter with their traditional litter to begin with and gradually phasing out the shop-bought litter as they grow accustomed.